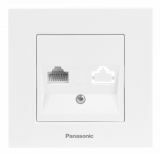 Telephone and Data socket, single RJ45 Cat5e, white, WKTC0404-2WH Network rosette, single, from the Panasonic Karre Plus series, model WKTC0404-2WH. 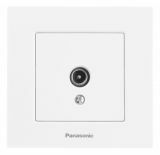 Telephone and data socket, Karre Plus, Panasonic, double, RJ45, CAT5е, white, WKTC0406-2WH Network rosette, dual, from the Panasonic Karre Plus series, model WKTC0406-2WH. TV socket, Lossless, white, WKTC0452-2WH TV wall jack, single, from the Panasonic Karre Plus series, model WKTC0452-2WH. Telephone and Data socket, complete, RJ45 Cat5e, beige, WKTC0404-2BG Telephone and data socket, single RJ45 Cat5e, complete from Karre Plus series from Panasonic. Model WKTC0404-2BG. 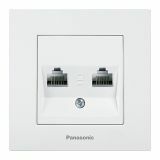 Double Telephone and Data wall socket, complete set, RJ45 Cat5e, beige, Karre Plus, Panasonic, WKTC0406-2BG Telephone and data socket, double RJ45 Cat5e, complete from Karre Plus series from Panasonic. Model WKTC0406-2BG. 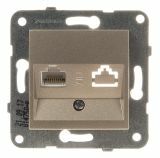 TV wall socket (single), beige, Karre Plus, Panasonic, WKTC0452-2BG TV wall jack, single, from the Panasonic series, model Karre PlusWKTC0452-2BG. 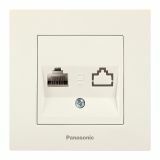 Telephone and Data socket, single RJ45 Cat5e, silver, WKTT0404-2SL, mechanism+rocker Single telephone and data socket, mechanism+cover plate from Karre Plus series of Panasonic for built-in mounting. Model WKTТ0404-2SL. 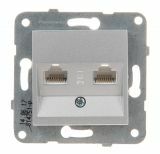 Telephone and Data socket, double RJ45 Cat5e, silver, WKTT0406-2SL, mechanism+cover plate Double telephone and data socket, mechanism+cover plate from Karre Plus series of Panasonic forbuilt-in mounting. Model WKTT0404-2DG. 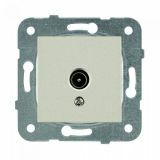 TV socket, Lossless, silver, WKTT0454-2SL, mechanism+cover plate Single TV socket, mechanism+cover plate from Karre Plus series of Panasonic for built-in mounting. Model WKTТ0454-2SL. 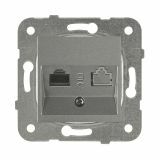 Telephone and Data socket, RJ45 Cat5e, bronze, WKTT0404-2BR, mechanism+cover plate Single telephone and data socket, mechanism+cover plate from Karre Plus series of Panasonic for built-in mounting. Model WKTТ0404-2BR. 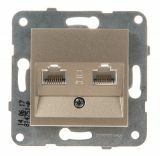 Telephone and Data socket, double RJ45 Cat5e, bronze, WKTT0406-2BR, mechanism+cover plate Double telephone and data socket, mechanism+cover plate from Karre Plus series of Panasonic for built-in mounting. Model WKTT0406-2BR. 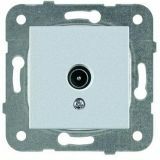 TV socket, Lossless, bronze, WKTT0454-2BR, mechanism+cover plate Single TV socket, mechanism+cover plate from Karre Plus series of Panasonic for built-in mounting. Model WKTТ0454-2BR. 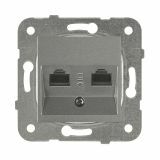 Telephone and Data socket, single RJ45 Cat5e, dark gray, WKTT0404-2DG, mechanism+cover plate Telephone and data socket, mechanism+cover plate from Karre Plus series of Panasonic forbuilt-in mounting. Model WKTT0404-2DG. 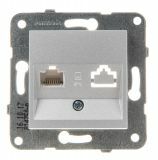 Telephone and Data socket, double RJ45 Cat5e, dark gray, WKTT0406-2DG, mechanism+cover plate Telephone and data socket, mechanism+cover plate from Karre Plus series of Panasonic for built-in mounting. Model WKTT0404-2DG. 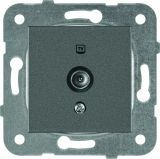 TV socket, Lossless, dark gray, WKTT0454-2DG, mechanism+cover plate Single TV socket, mechanism+cover plate from Karre Plus series of Panasonic for built-in mounting. Model WKTТ0454-2DG.